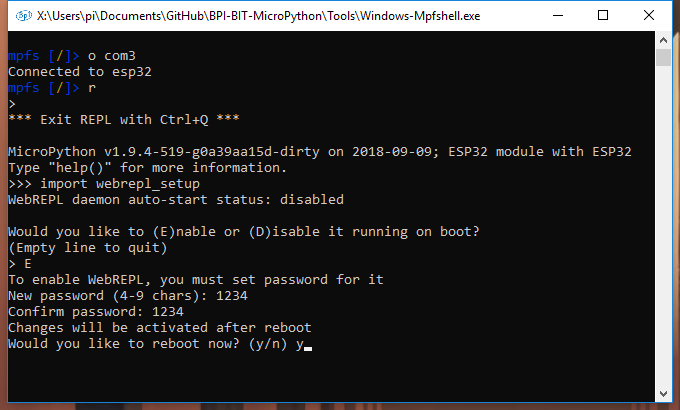 As shown below, import wifi is invoked by default in boot.py, so you can also call wifi.try_connect() directly from REPL. 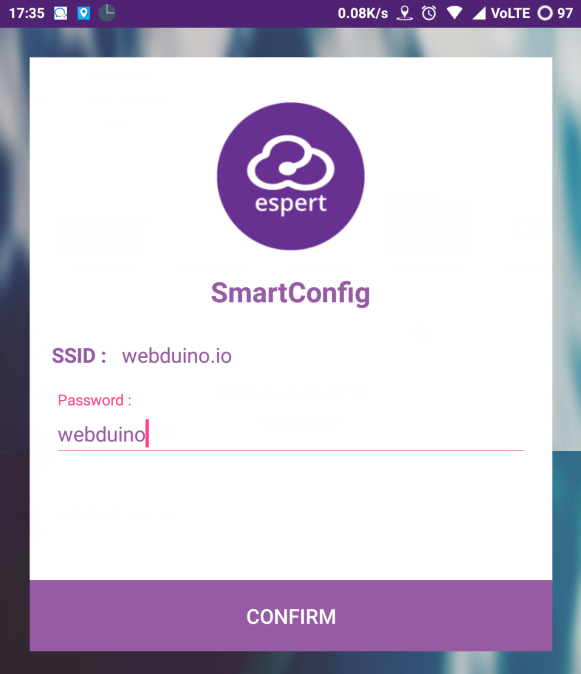 In the default networking mode, if no network has ever been configured, the board will initially automatically connect to the WIFI hotspot with WIFI name:webduino.io password:webduino. If not near the hot spot, will output the no AP found, and my surroundings are prepared ahead of the hot spots, so to get an IP address 192.168.10.185 (pictured), otherwise it will be repeated output connection problems (this does not affect your input and output), if you don't want it to continue to connect to the Internet, you can manually enter wifi.close() to stop the wifi connection. 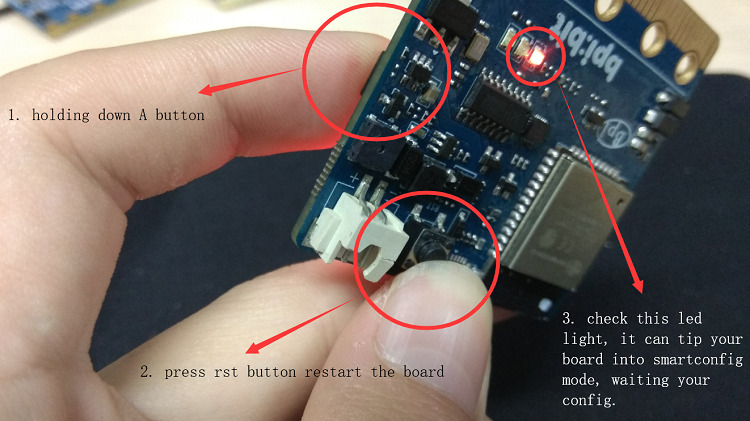 Of course, your WIFI hotspot is definitely not this one, so now you can press and hold A key and press the reset key to start to enter the mode of distribution network, connect the board to other WIFI, help the board connect to the specified WIFI, enter the mode of distribution network of SmartConfig, LED (18) will light up, LED (18) is the LED light in the previous chapter. 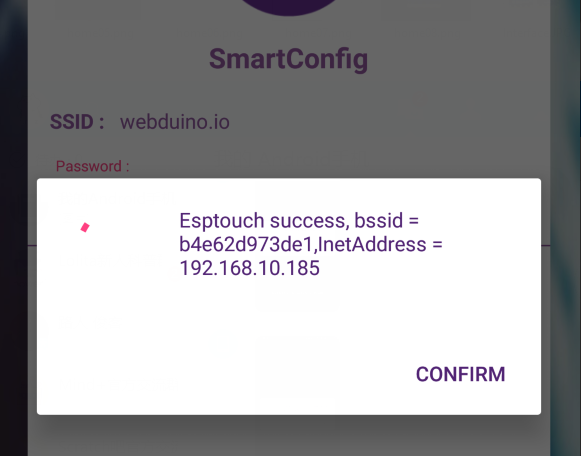 Take android-smartconfig.apk as an example, connect the mobile phone to WIFI first, then connect the board to the same WIFI, and then input the password of the WIFI to the software, which will tell the board how to connect to the WIFI. Wait for a while. If the network mode fails, it will restart automatically within two minutes. 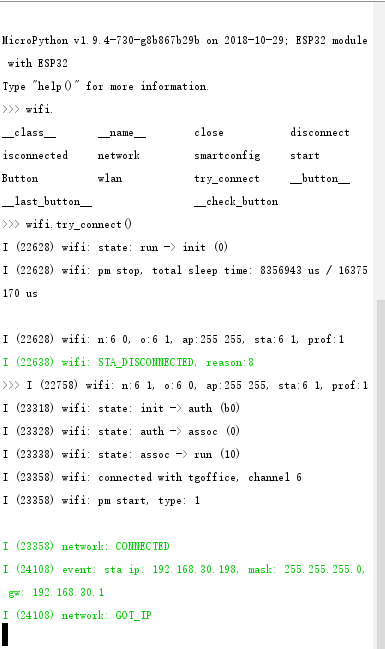 When the distribution network is successful, the LED light will turn slightly bright, and then REPL will output the IP address of the board connected to WIFI, as shown in the figure below: 192.168.10.185. It is worth noting that 3de1 corresponds to the name of the board, which will be used later. And on the phone, also can see the IP address of the board, at this time the board has completed the network configuration. Tip: if the network fails, please follow the following procedures to troubleshoot the problem. 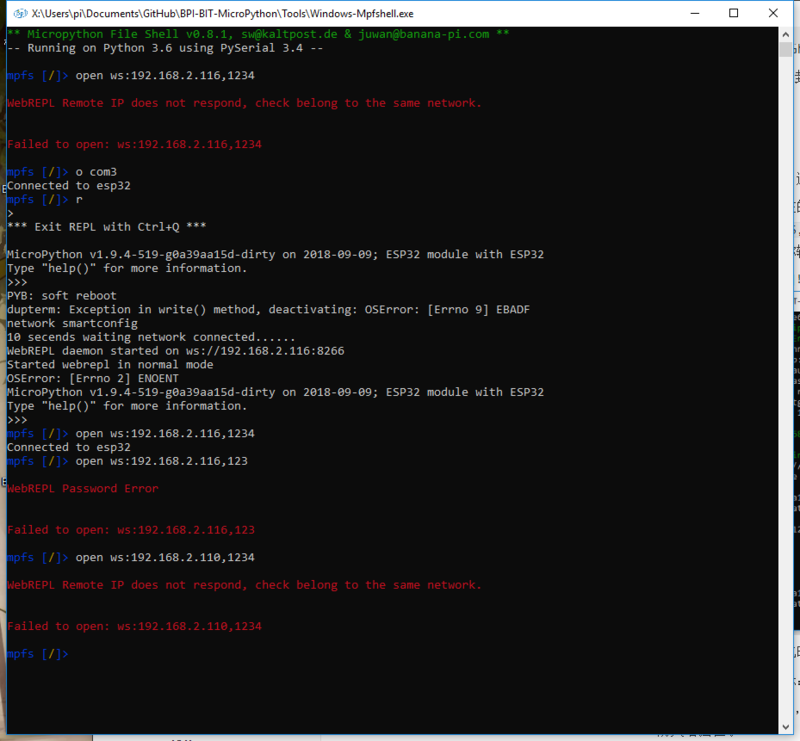 (you can now get the wifi_cfg.py fetch configuration first.) 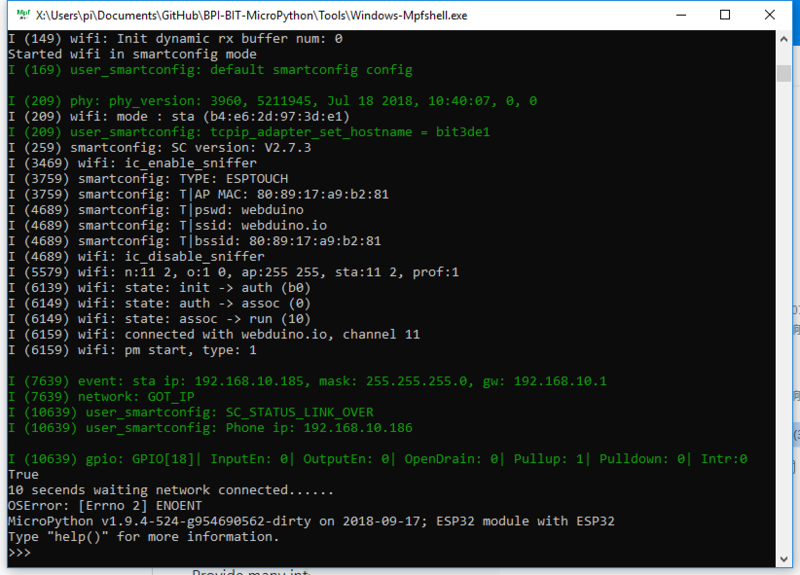 use put wifi_cfg.py in the same directory as the mpfshell to replace the current WIFI connection configuration. 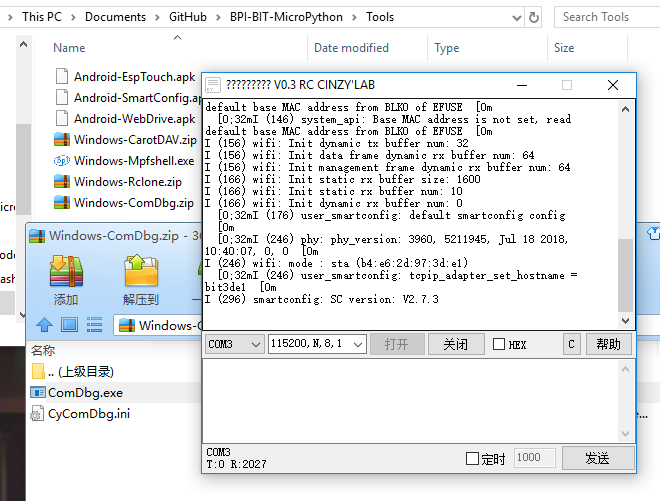 Note: before use, make sure that the application is allowed through the network firewall, and the computer and the board are connected to the same network (the same WIFI). Before you do that, enter repl mode and import webrepl_setup to start the network configuration process. According to the steps, they are (e, 1234, y). You can see that the connection is successful, and the board can be operated wirelessly. You can also restart the reset and try again. 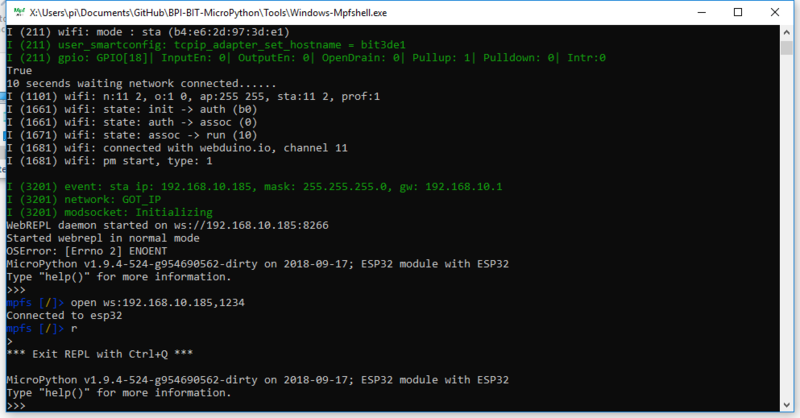 1,The WebREPL Remote IP Does not respond to the answer that one possibility can be that a network different from the board, and the other can be that a variety of software or hardware firewalls are blocking the response. 2,Connection WebREPL Password Error, prompt WebREPL Password Error, re-enter the Password, perhaps you are connected to someone else's board. 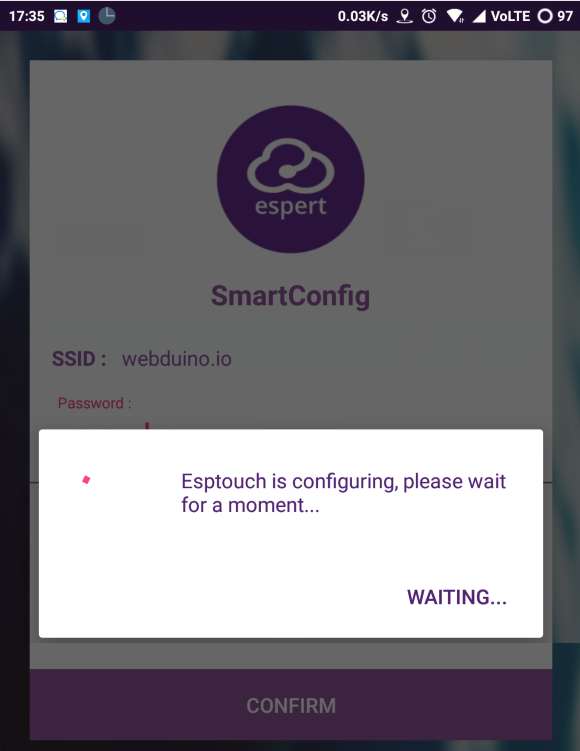 If the connection fails, press Ctrl + D to reset the connection, and then exit to replace the wireless connection. 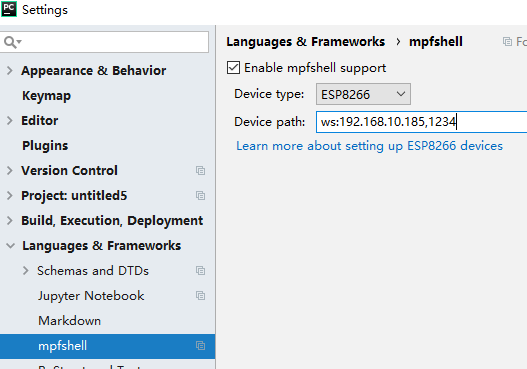 Tip: as to how to use the wireless connection of the Pycharm Mpfshell plug-in, you only need to set up ws:192.168.10.185,1234 in the device path (comx). 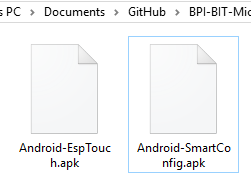 These operations are all performed in mpfshell. If you use Pycharm programming, you can also operate in mpfshell tools. I believe you should all be able to operate. This page was last edited on 21 February 2019, at 03:40.